Throughout the years that electronic calculators have been manufactured Sharp has been a pioneer at the forefront of their development. Tokuji Hayakawa established a metal works in Tokyo in 1912, and in 1915 invented the "Ever-Sharp Pencil", from which the "Sharp" name is derived. In the 1920s the company started manufacture of radio sets, and followed on in the 1950s with the manufacture of television receivers. The Hayakawa Electric Industry Company, as it was called, became more involved in electronics, and in 1964 produced one of the first transistorised electronic desktop calculators, the first of Japanese manufacture, the Sharp CS-10. 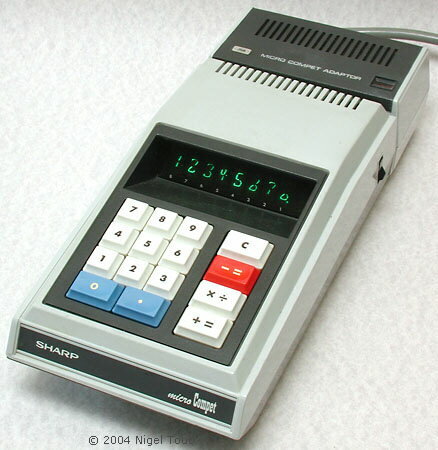 1964 - Sharp Compet CS-10A, one of the first all-tranistor electronic desktop calculators, and the first of Japanese manufacture. 1967 - Sharp Compet CS-31A, calculator using bipolar integrated circuits, and Sharp Compet CS-16A, calculator using MOS integrated circuits. 1967 - developed the vacuum-fluorescent display with Ise Electronics, which was first used in the Sharp Compet CS-16A. 1968 - With funding from the Japanese Ministry of International Trade and Industry (MITI) the company investigated the use of large-scale integration integrated circuits (LSI) in 1968. This resulted in a prototype calculator using 11 LSI ICs. 1969 - In collaboration with the Autonetics division of Rockwell, Hayakawa produced the first calculator to use LSI integrated circuits, thereby greatly reducing the component count. The circuit of the AC powered Sharp QT-8D used just 4 LSI ICs, 1 MSI IC, and 1 SSI IC. 1970 - Developed from this was the Sharp QT-8B, the world's first hand-held, battery-powered, electronic calculators. One of the first small hand-held calculators, the Sharp EL-8, followed shortly, with its development aided by MITI, the Japanese trade ministry. 1972 - Sharp EL-801, was the first calculator to use very low power consumption CMOS integrated circuits. 1973 - Sharp produced the first pocket-sized LCD calculator, the Sharp EL-805, which also combined the display and electronics on a single glass substrate. More details of these developments are given below. Sharp calculators sometimes have 'ELSI' in, or as an additional description to, the model name. This stands for 'Extra Large-Scale Integrated'. "Sharp" had been the trade name of Hayakawa Electric Industry Company for many years, and so on January 1st. 1970 it formerly changed its name to Sharp Corporation. 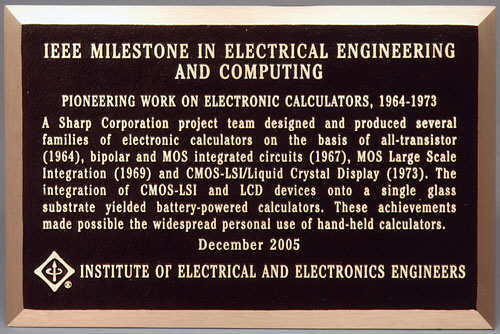 For its pioneering work in the development of electronic calculators Sharp Corporation was awarded the prestigious IEEE Milestone in Electrical Engineering and Computing in December 2005. On 1st December 2005 Sharp Corporation of Japan was awarded the prestigious IEEE Milestone in Electrical Engineering and Computing by the Institute of Electrical and Electronics Engineers, of the U.S.A., in recognition of its pioneering work on electronic calculators, 1964-1973. CS-10A - All-transistor calculator, 1964. CS-16A - Bipolar and MOS integrated circuits, 1967. EL-805J - CMOS-LSI and LCD devices on a single glass substrate to produce a hand-held LCD calculator. This was one of the first all-transistor electronic desktop calculators, and the first manufactured in Japan, launched in 1964. It features a full-keyboard. A typical electronic desktop calculator of 1968, using dozens of integrated circuits of the time and Nixie-tube type display. Launched in 1969, this was the first calculator to use Large-Scale Integrated Circuits (LSI). This allowed a great reduction in size and made it the smallest electronic calculator of the time. Developed from the AC-powered QT-8D, above, this was one of the world's first hand-held, battery-powered, electronic calculators and was launched in 1970. This model was developed from the QT-8B above and the electronics was squeezed into a calculator that would fit into a very large pocket. Dates from late 1970/early 1971. This small machine, launched in 1972, was the first calculator to use very low power consumption CMOS integrated circuits, though married with a power hungry LED display. 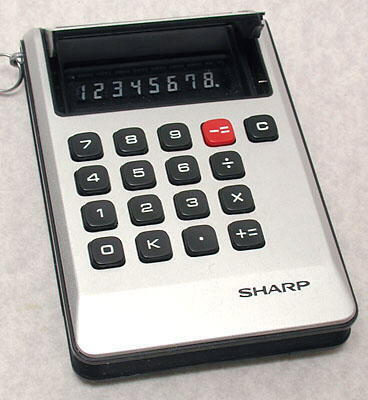 The Sharp EL-805, introduced in 1973, was the first pocket-sized LCD calculator. 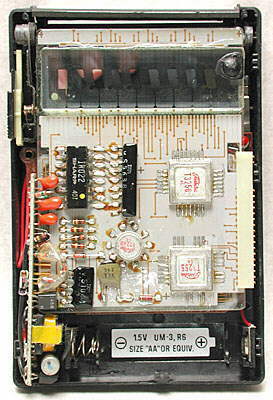 The Sharp EL-805 also pioneered the integration of the LCD display and electronics on a single glass circuit board. Sharp manufactured calculators which were sold by other companies, in this case the Swedish company Facit. This is inside a Facit 1106, similar to the Sharp EL-805S. For further photographs of Sharp hand-held calculators see the Calculator Photo Library on this site. The following details about the development of the early Sharp electronic calculators is based on information kindly supplied by Sharp Corporation. In the early 1960s several companies around the world started to investigate the possibilities of transistor-based electronic calculators, which would have the advantage of quietness, speed, and long life. Among these companies was Sharp, where in 1960, a project team of computer engineers, headed by Atsushi Asada, started to design logic circuits using fairly substantial quantities of discrete components such as transistors, diodes, resistors, and capacitors. At that time germanium transistors, used for consumer products like radios, were much cheaper than silicon transistors, used for high-tech products like large computers, and hence Sharp engineers decided to adopt the former. 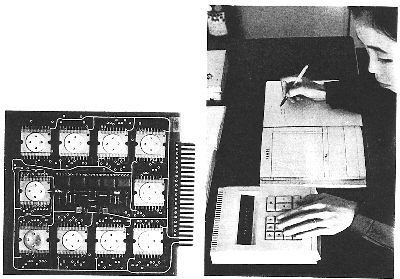 Although the Germanium transistors were prone to reliability problems and manufacturing difficulties, after four years' struggling with various technical difficulties the project team succeeded in the commercialisation of an all-transistor electronic calculator, the Sharp Compet CS-10A. This was launched in 1964, and even though it cost 535,000 yen (equivalent to US$1,490; @ $1=360 yen), weighed 25 Kg (55 pounds), and consumed 90 Watts of power (using 530 transistors and 2,300 diodes), the demand for this calculator grew so rapidly that soon the monthly production of three hundred could not keep up with demand. By chance, on the same day as Sharp launched the CS-10A, Sony Corporation released to the press a details of a prototype all-transistor calculator, but this did not come onto the market until 1967. Later in 1964 the Japanese manufacturers Canon and Ohi Electric also launched all-transistor calculators. Having realised the defects of germanium transistors, as already noted, another development team had been organized at Sharp to develop a new calculator using silicon transistors, which had been falling in price and were more robust. This resulted in 1965 in the launch of the Sharp Compet CS-20A silicon-transistor calculator, with reduced price of 379,000 yen (US$1,050), weight of 16 Kg (35 pounds), and power consumption of 35W. Silicon transistors had been developed by electronics companies, and around this time they had started to commercially produce integrated circuits, that is silicon chips on which multiple transitors are formed, linked together to produce a functioning electronic circuit. The early technology could only put a small number of transistors into an integrated circuit (ICs) and was subequently called Small-Scale Integration (SSI). This enabled the production of a few logic gates on a single chip, but developments over the years have lead to very-large-scale ICs which now have millions of transitors on a single chip in the form of our familiar microprocessors. As soon as the project team found out about the emergence of IC technology, they began to experiment with bipolar IC's (that is based on standard tranistors) which would make it possible to further reduce the power consumption as well as the physical size of a calculator. After a few years' trials, the team perfected a calculator incorporating SSI ICs, the Sharp Compet CS-31A, in which the whole memory unit was implemented by bipolar IC's produced by Mitsubishi. This calculator was put on the market in February of 1967, with further reduced price of 350,000 yen (US$970), weight of 13Kg (28.5 pounds), and power consumption of 25W (using 28 bipolar IC's, 553 transistors, and 1,549 diodes). In a further effort to reduce the size and power consumption, as well as to raise the reliability, the project team utilised several types of MSI (Medium-Scale Integration) IC logic circuits, such as inverters, logic gates, shift registers, flip-flops, etc., employing MOS (Metal Oxide Semiconductor) technology produced by Hitachi. Sharp also adopted a new type of vacuum-fluorescent display (VFD) tube produced by Ise Electronic (Iseden). In December 1967 the Sharp Compet CS-16A, incorporating these devices, was launched. Greatly reduced were its price of 23,000 yen (US$640), weight of 4Kg (9 pounds), and power consumption of 10W (using 59 MOS-IC's, 46 transistors, 400 diodes, and a 12-digit display using VFD tubes). By mid 1960's US manufacturers had opened a new page in semiconductor technology, i.e. LSI (Large-Scale Integration) ICs based on MOS (Metal-Oxide Semiconductor) technology. This made it possible to integrate thousands of transistors on a single chip. Although the U.S. semiconductor manufacturer Texas Instruments (TI) first demonstrated a prototype electronic calculator, called the "Cal-Tech", using this technology in late 1966, the comapny was not ready to move into the consumer electronics market, remaining a component manufacturer. Besides TI, there were several LSI manufacturers, such as Motorola, AMI, Fairchild Semiconductor, RCA, National Semiconductor, and Rockwell (North American Rockwell), to which Dr. Tadashi Sasaki of Sharp attempted to offer the collaboration on developing a LSI calculator. However, it was only Rockwell's Autonetics Division that accepted the offer of Dr. Sasaki, and a business agreement between these two companies was soon reached. A team of system design engineers, headed by Yukihiro Yoshida, was sent to Rockwell where, with the support of Rockwell's design capability, they set about implementing the required set of MOS-LSI circuits by using the four-phase MOS dynamic logic which was originally developed by Rockwell. The journal Electronics in November 1968 showed the above photograph of an experimental calculator from Sharp, using the latest developments in integrated circuits, with the following description: "This is the miniaturized experimental calculator that was developed by Hayakawa [Sharp] using large scale integration techniques. On the board are 11 MOS integrated circuits with 300 to 400 elements apiece, three bipolar hybrid IC's, and four bipolar transistors. Using government money, the Japanese company expended $42,000 on R&D and figures another $130,000 will be spent designing the commercial prototype that's due next March. The machine shown here is just 2.8 inches high, 6.3 wide, and 8.7 deep." After a few years of hard work the design team succeeded in developing a LSI calculator, the Sharp Compet QT-8D, based on just four MOS-LSI chips produced by Rockwell. This was manufactured in the Nara factory, in Japan, and put on the market in August of 1969. This time there was a drastic reduction in price to 98,000 yen (US$270), weight to 1.4Kg (2.5 pounds), and power consumption to 4W (using 4 MOS-LSI's and an 8-digit display using VFD tubes). Since the power consumption was now very low it was feasible to add a rechargable battery power supply to the AC-only QT-8D to form the Sharp Compet QT-8B, and so produce the first handheld calculator. Using this technology, small low-cost electronic calculators were on the horizon, and many companies joined the race to produce pocket calculators. These LSI calculators achieved the distinction of being recognized as the most prominent of the first consumer applications of LSI ICs. In the early 1970's in Japan LSI calculators acted as the strongest driver of the semiconductor production. For example, in 1971 40% of the total semiconductor market in Japan went into calculators. 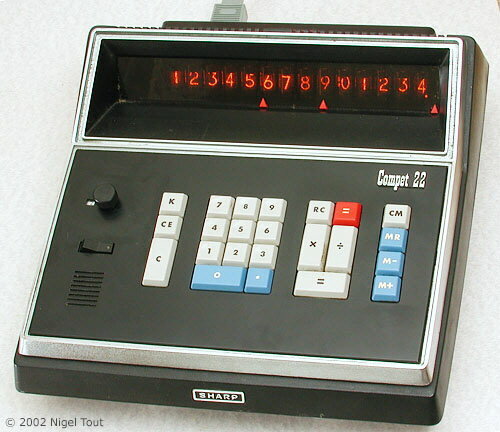 The Sharp Compet EL-8 was developed from the QT-8B, but with much reduced size approaching that of a pocket calculator. Sharp's subsequent LSI hand-held calculator, the Sharp Compet EL-811 released in late 1971, had electronics incorporating ROM (Read-Only Memory) and RAM (Random-Access (read & write) Memory). The ROM stored the micro-instructions for arithmetic, control, and input/output operations, each invoked in a pipelining scheme driven by four-phase clocks, and the RAM provided the working memory for registers used for arithmetic and control operations. This use of ROM and RAM implemented the execution mode of today's microcomputers. 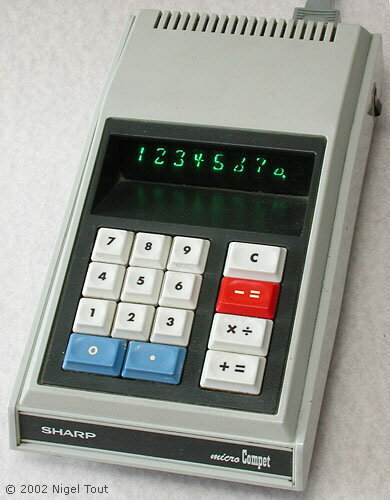 In August 1973 Sharp launched the first calculator using the very low power C/MOS (Complementary Metal Oxide Semiconductor) ICs, the Sharp EL-801. The journal Electronics gave information about the circuitry of the EL-801, from which the following is extracted: "The biggest plus of the C/MOS circuits is low-power operation; one transistor of the pair is always off and current only flows in brief bursts during the switching period. In Sharp's calculator, total circuit power consumption - including logic circuits, three registers, and clock generator - is only 2 milliwatts. This is about 1% of the power drain of comparable p-channel MOS circuits [commonly used at the time]. Basic calculator functions, which include a constant, are performed by two LSI C/MOS chips. Initially Sharp engineers had difficulty in fitting circuits on reasonable size chips because C/MOS in general requires twice as many elements as p-MOS. But advances in circuit design made it possible to reduce the number of elements by about 35%. One of the two chips, which has about 3,300 elements in a 28-pin ceramic package, performs all logic functions. The other, with about 1,500 elements in a 10-pin TO-5 package, contains three shift registers and the 40-kilohertz clock." The keyboard was also a pioneering usage of conductive rubber contacts, in place of metal contacts. A development team headed by Isamu Washozuka had been engaged in developing LCD devices for calculators. Although Rockwell had already produced some large, desktop, AC-powered LCD calculators, the Sharp team succeeded in integrating CMOS-LSI ICs and LCD devices onto a single glass substrate. This was termed COS or Crystal On Substrate. The few previous LCD calculators, from Lloyds, had been large, but, using this technology, the Sharp Compet EL-805 calculator was the first pocket-sized LCD calculator. This was a breakthrough in the sense that the MOS-LSI and LCD technologies established by this calculator were the starting point for the development of the low-power mobile appliances and personal computers of today. For more information about the history of Sharp visit "A Sharp Journey" on the Sharp Corporation site.